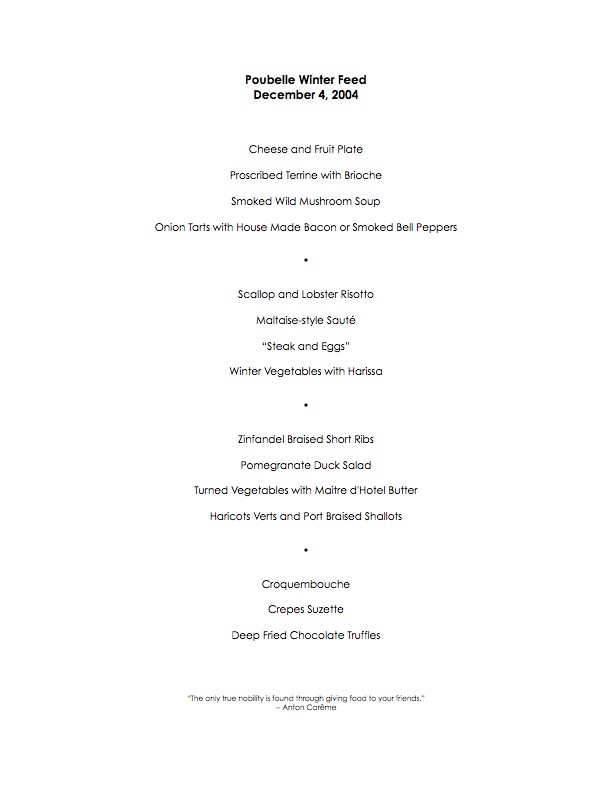 This year, I had Derrick on "guest chef" duty. In recent years I've been tapping one of my helpers to come up with a dish of their own that they can take charge of in the kitchen. Usually we work it back and forth a bit, and usually try it out once sometime before the big day to work out any kinks and maybe come up with plating. Derrick did a great duck salad with pomegranate (just pure juice reduced by half in order to form the sauce -- genius!). Derrick writes about his dish here with pictures. 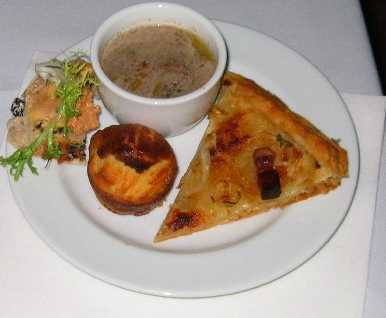 It was a great success over all, and made a nice transition into some of the "heavier" parts of the meal. Time to make the Duck Here Derrick and Mark work on the plating of the duck. Note that each one is nestled in it's own cup, made from a crepe that had in turn been cut into a circle, and crisped in the oven over the backside of a muffin tin. 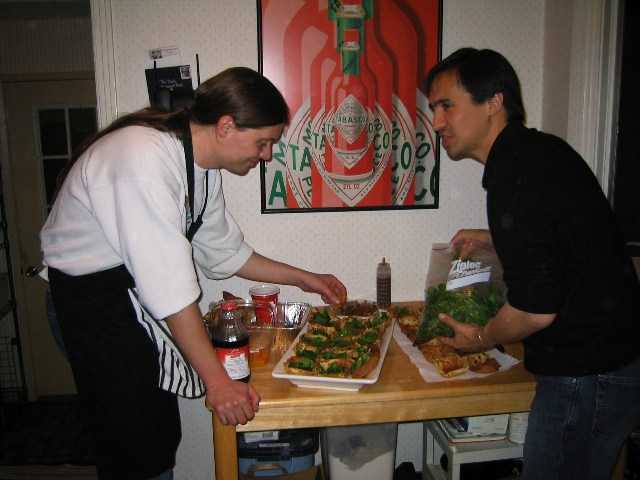 This is a pretty typical kitchen scene from during the party/service. Things are fast paced, and multiple people get the dish together for presentation, but nothing is too crazy. Well, most of the time anyway. For the rest of the "fish" courses, we did two vegetarian dishes. First up, was a stew of winter vegetables (calliflower, celery root, small squashes) to which we added harissa (a hot pepper puree) and some green olives. Some baby eggplants were sauteed for around the dish. We didn't want the eggplant in the stew for fear they would have become mushy. 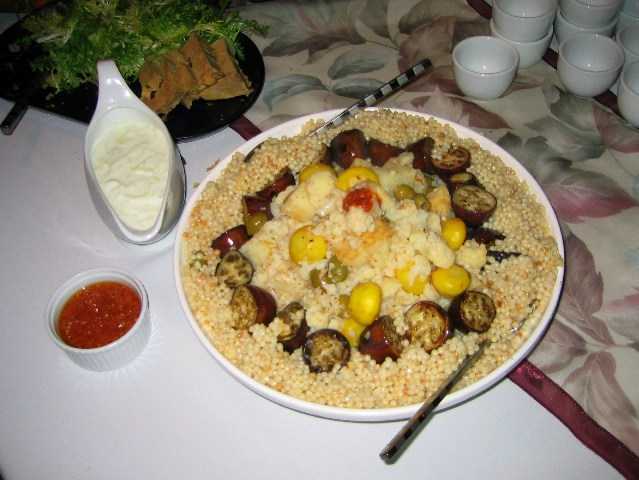 In keeping with the Mediterranean theme of this dish, we served it over large cous cous, and with a side of additional harissa (for those who like it hot), and a cucumber/yougurt sauce (for those who do not). 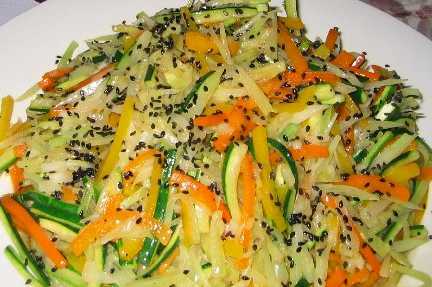 This stir fry was simple in ingredients -- fennel, onion, bell peppers, zucchini -- but they were sliced perfectly thin and consistant as part of the prep work. Tons of effort, and the results show it! Just a quick stir fry before service. The sauce was a beurre blanc made with a blood orange reduction. "Sauce Maltaise" is a hollandaise sauce traditionally made with blood oranges, and called that because Malta is the original source of blood oranges. I've made this type of reduction before and used it with shrimp to good results. And finally, one of two risottos that we made this night. The stock was made with the trim from the scallops, plus shallots and thyme, along with a lobster stock that I'd had frozen previously, plus water from re-hydrating a handful of lobster mushrooms. The lobster mushrooms themselves also were chopped up and went into the risotto. The mushrooms, along with bright red lobster butter at the end, helped to color the risotto a wonderful shade of redish brown. Development of this dish started the day after the last party. The trim from scallops was left over, and so I made a risotto starting from that point. I knew that for a real dish I'd have to have actual scallops on top, and added the lobster mushrooms and lobster butter late in the development process. I'd had a lobster risotto at Capo in Santa Monica that had been colored by lobster butter. 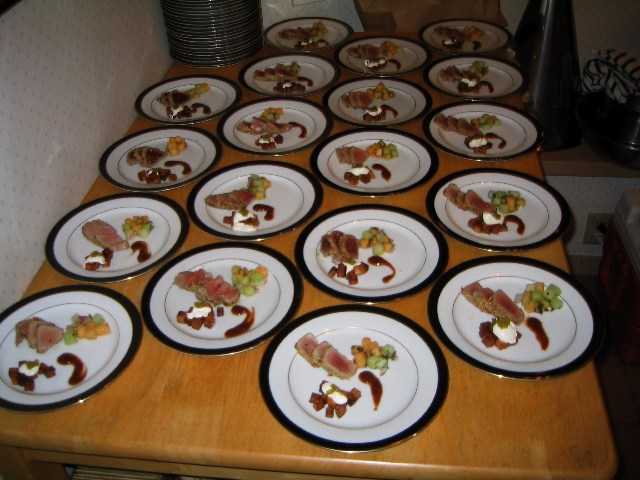 This year, we decided to do one individually plated dish. We've never done this before, but I'd been meaning to try out a varient of this particular dish for a few years now. 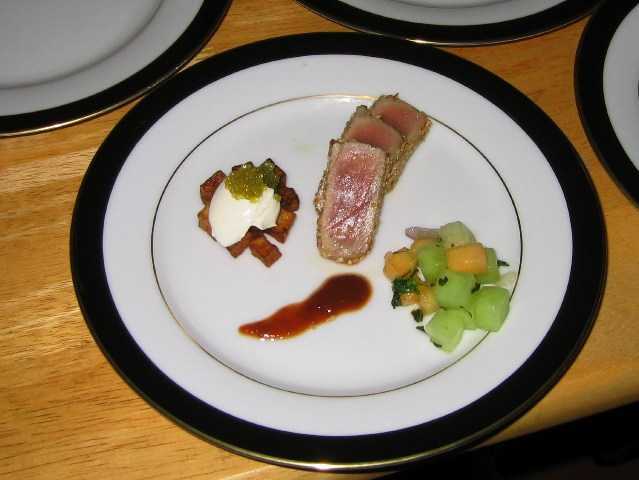 The basic idea was rare seared tuna, sliced, with some smaller side dishes to go with it. We served this as part of the "fish" course (these dinners are broken up into apps, fish, mains, and deserts). Carol had given me the idea of doing something called "Steak and Eggs" and I decided to go in a sort of Thomas Keller direction and play with it. The idea was to have things on the plate that might mirror or suggest a dish of "steak and eggs" that you might get at a diner. But, of course, the flavors wouldn't be just something like that. We made up 35 of these plates in two waves. Each person in the kitchen was on one or two of the parts to the plates and we rocked the out assembly line fashion. It was a lot of fun to do one dish like this -- not sure that it would be fun or practical to do this every year, or for more than one. But it was a nice change of pace to be able to plate individually. Sometimes the platters can get a bit "plain" looking out of pure necessity. We interupt the normal party posts (well, I swear I'll get back to them over the holiday break!) with a possible last minute gift for the baker in your life. Alton Brown's: I'm just here for more food has just been released. This is a follow-up to his first book (which I also recommend), "I'm just here for the food". This second book is all about baking (the first was about cooking in general). While I haven't yet finished it (I've made it through part of the "parts" chapter and also the first "method" chapter) I can already say it's going to be on the top of my lists for baking books, particularly for someone just learning the craft. Alton has decided to arrange the book by mixing method, which is how professional bakers usually do it. If you look at recipe "cheat sheets" made by bakers, they usually just list percentages of ingredients. They will then just specify the mixing method (and maybe baking temperature/time). Some of them will leave off the mixing method entirely and assume that a real professional would know it based on the order and ratios of the ingredients alone! "I'm just here for more food" takes this approach solidly to heart, to the point of having little "flaps" with the basic method at the start of each chapter. This serves to drive home the commonality of the recipes in the chapters, saves on space, and also is a handy bookmark for what you are cooking at the time. I found this "method based" mentality a huge leap forward when I was taught it at cooking school -- but this is the first time I've seen it be such a core part of a cooking text. This book is somewhere between an introductory text and a reference guide. It's certainly the first I'd recommend for the beginner. But unless you are a professional, or someone who's already become hip to the "method mentality", I think this book would be of interest even to experienced bakers. I certainly stayed up far too late last night reading it already. This year, I sort of did a "best of" for the appetizers, making some of my favorites that I've also done enough times for it not to be overly taxing for my brain. The mushroom soup is very easy (most soups have a large make-ahead component anyway) and based upon a standard cream-based mushroom soup. My only change is using some wild mushrooms for additional flavor, and smoking the main component mushrooms first. Several people likened the resulting flavor to a single-malt scotch. The onion tarts I've made countless times before (both in bacon and non-bacon varieties) and are from one of my heros, Michael Richard. One change this year was that I made the bacon myself. That's sort of a fun thing to do on a series of long weekends. Well, I think it's fun anyway. Finally, of course, what would a birthday be without foie gras (we may know in 7 more years)? It came out pretty much the way it does most years. I had meriko come over this year to clean, slice, and pack the foie into the terrine mold. It's a great learning experience if one has never handled foie before, and after eight years, I've pretty much hand all of the practice that I need. We plated it with a pile of frisee and black truffle oil, and this year brioche instead of a pain de mie. Foie terrines are also great for parties because you really need to make them a week ahead so that the flavors can blend. - cold smoke 1 pound mushrooms. Normal field mushrooms are fine, but I used portabellos because they are easier to manipulate on the grill. If using portabellos, scrape off the gills to avoid coloring the soup a dark gray color. - chop mushrooms, sautee with 1 large onion until browned. - add a small amount of sherry as a final flavoring. I used one from Merryvale Winery called "Antiguia" which has a mushroom overtone (I think). - Roll out puff pastry to 1/4 inch thick. I make my own, but store bought is also fine. If possible, find one made with butter rather than shortening. Cut a round using a knife or pizza cutter, about 8-10 inches around. 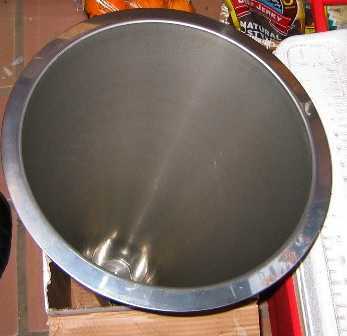 - Heavily "dock" (poke holes) the inside of the round with a fork. You almost can't have too many holes. This keeps the inside from rising too much, while allowing the outside to "balloon" up and form the outside edge. - Cut bacon or bell pepper into thick matchstick length "sticks." - Spread the onion mixture in the center of the round. You want a full coverage of onions, which will probably seem like a bit much. It's OK, the cream thickens while the tart bakes. - Place on baking sheet, bake for 35-45 minutes or until fully cooked and the bottom is nicely browned (you'll have to peak in order to see). - Slice like a pizza and serve. To say that I was nervous about assembling the Croqombouche is understating it quite a bit. I figured it was either going to be a) a complete success or b) a total failure. I figured that if nothing else, we could just pile up the cream puffs and present it that way. First up the next day was filling the cream puffs. I like to use a combination of pastry cream (seen in the plastic bag to the left in the photo) "lightened" with sweetened whipped cream. You can see how much lighter in color the filling gets when you do this. I think that pastry cream by itself can be a bit too heavy inside of a cream puff. This combination is technically known as "diplomat cream." While Mark and Derrick were busy getting the puffs filled, meriko and I started in on the mold. This one is about 19 inches high and about 12 across. It's a specialty item that you can order over the Internet. They are expensive and really only useful for this one task. Not the most practical thing to buy, but there you go. Before filling, we oiled down the interior very well -- this doesn't keep the carmel from sticking, but does make it possible (one hopes) to get it to release later. We used a cardboard box to hold the mold when we were not actively filling it, but most of the time meriko had to hold the hot, and increasingly heavy mold. We didn't get any action shots while the filling was going on. Between people filling the cream puffs, making batches of carmel (it took three of them), filling the mold itself, cleaning up, or just staying out of the way, picture taking didn't happen much. Filling the mold took about an hour. It went pretty well and once we got into the groove it also went pretty fast. 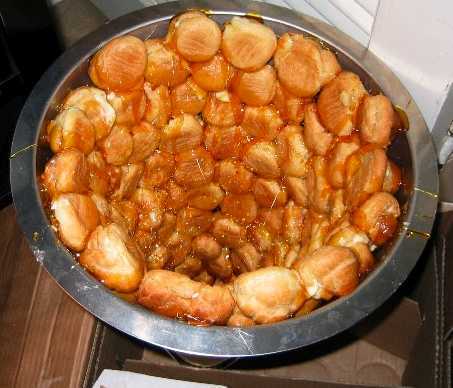 Each cream puff is dipped in carmel (with tongs when the carmel is still very hot, and later with careful finger tips) as much as possible without burning oneself. Then the puff is positioned into the mold, working up the sides and around. Both of the "fillers" wear latex gloves, so that when (not if) a bit of carmel hits your hand you a) have a bit of protection and b) can pull the latex away (or the entire glove off) to get the heat off your hands. The outside of the mold also gets hot as the metal begins to wick away the sugar's heat. If you've never worked with carmel before, it's very hot, and sticks to you when it hits. Some of the worst burns you will ever get in a kitchen can come from it. I only managed to get a few small drips on my gloves while I was working, nothing that was really even visible in a few days. Extra carmel from the end of each batch was drizzled over a broomhandle (with plastic wrap over it and a bunch of newspaper on the floor below) using a fork to create carmel "strands." 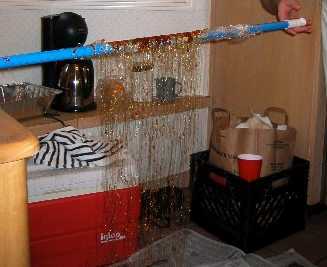 This is pretty standard sugar work, sometimes called "spun sugar" and is very fun and impressive. It's also, if you aren't careful kind of messy. The carmel at this point has completely set (we waited around 15 minutes) and has secured the puffs to the sides (and hopefully to each other). In theory, or in a smaller mold, you might be able to release it via a spatula down the sides, but there was no way this was going to work this time. Time for a welding torch, applied just enough to the sides to get the carmel to melt just a bit. Fireplace gloves and towels were then used to lift the mold away to reveal the hopefully still standing finished piece. We placed the mold on the final plate, because once you remove the mold, you really don't want to try to move it to another one. 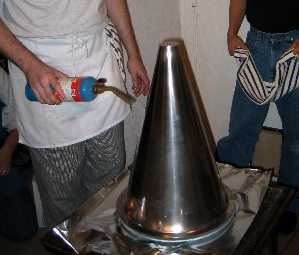 After unmolding, the spun sugar is spiralled around the cone to help hide some/most of the carmel inperfections or drips. We finished it off around 4 in the afternoon and hid it in a back bedroom (with the furnace vents off) until it was ready to be revealed. 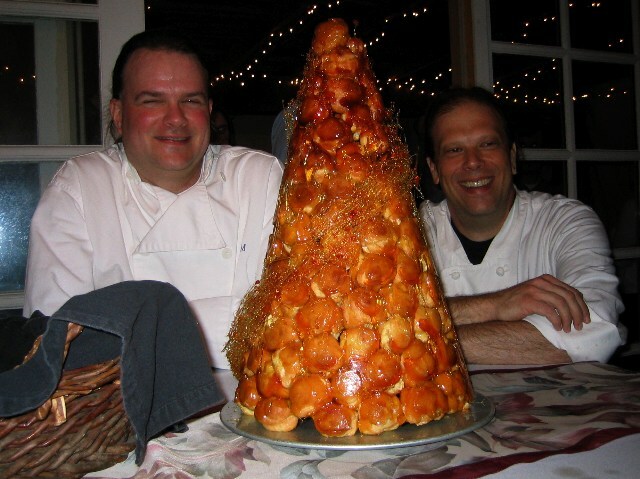 Here's the Croqombouche on the table with me and William. How do you eat it? 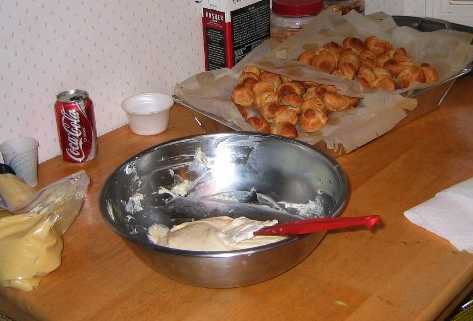 You take a bread knife and hit, crack, and/or saw away the cream puffs from one another. I've been told that in England (where Croqombouche have become common at weddings) there is a tradition of breaking the entire thing at one go into a tablecloth. We disassembled it in a much less impressive manner for this party. I simply cannot believe we pulled this off! It took almost three hours of work between all of the making and assembly, with involvement of the entire kitchen staff, and until it's done you really don't know what is going to happen. The final product was solid and was never in any danger of collapse. In fact, the next day the remains were still standing and still crunchy. The other thing that sort of amazed me was that it tasted good! The crunchy exterior of the puffs made them very different than normal cream puffs. I'd certainly never (well, never say never) do this again as part of a larger party. But it might be fun to make (even a smaller one by partially filling the mold) for some other occasion when there wasn't also lots of other cooking needing to go on. The major task the day before the party was making the 12 dozen (slightly more, actually) cream puffs. These are the major ingredient in the Croqombouche. There's only about a pound of butter in the cream puffs themselves. But here's the top shelf of the fridge, packed from the store. 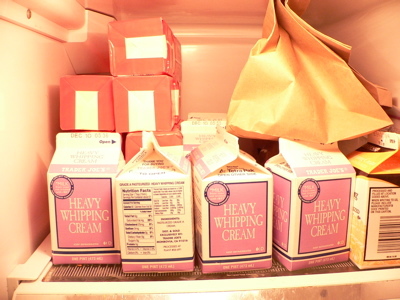 We ended up using around 12 pounds of the butter, two of which were in the form of clairified butter for cooking. It took four batches of my standard choux paste recipe -- that's 4 cups each of water and flour as a start -- to make enough of the dough or batter for all of the cream puffs. 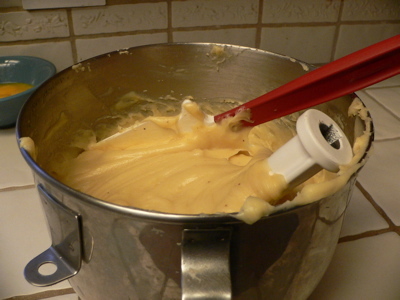 Choux paste is much easier to make if you transfer the cooked flour glob into a stand mixer for beating in the eggs. Cooking was done two trays at a time. It's close to an hour of cooking because you start in a hot oven, bake to get the right puff, then drop the oven to continue cooking the center, then slit the puffs and return to the oven (now off but still warm) and let them dry out. 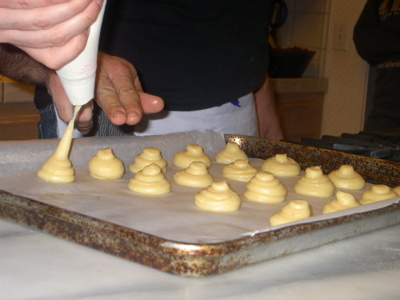 This is done so that you don't get soggy cream puffs -- especially important if you are making the shells the day ahead. Here are the puffs being pipped down. William is coming along behind and using wet fingers (important to keep the paste from sticking to them) to flatten down the tops. If I were better at piping, he probably wouldn't have had to flatten as many of them. We made them somewhere around 1.5 and 2 inches across. I didn't want them to be too small, but if we had made them larger the later assembly would have been more difficult, I think. I used two hints from Alton Brown this time in making my cream puffs. Use bread flour rather than all purpose. And swap out one of the whole eggs with two egg whites. The bread flour gives you more gluton and thus more structure. The egg whites help the cream puffs to be more dry. I'm not really sure that these changes made much of a difference. I've never had much problem with cream puffs. However, they certainly are simple changes to do. Besides, I needed the egg yolks for the pasty cream filling I was making to go into the cream puffs. The day before we also made the pastry cream (and bagged it into the fridge), made truffle centers, froze them, coated them (twice) in flour, egg wash, and bread crumbs, and re-froze them. This was lots of just straight production -- things that would have been impossible to try to do the morning of the party. This year prep was a somewhat mixed bag. Overall, we were ahead most of the day, and finished up with about 45 minutes to spare before the guests began to arrive. I had a few sloppy/missing items on the list, so of course we didn't catch them until a bit further on in the day. I had a few tense moments earlier in the day when I managed to mentally weed myself into not knowing what to do next. Training prevailed, and all went well. It was, as usual, a crazy amount of fun. We ended up swapping around some major things in the 2 to 4 pm timeframe because we decided it would be better to assemble the Croquembouche earlier rather than later. It was a one hour assembly and took three batches of caramel to pull off (just wait until you see the picture!). It's a testiment to my fellow chefs and their experience that we were able to do something so large and complex in the middle of all of the other dishes and not completely break down sobbing. A big one. More later with pictures.